The hardest part of living a healthy lifestyle is wading through all the information (and misinformation) out there. 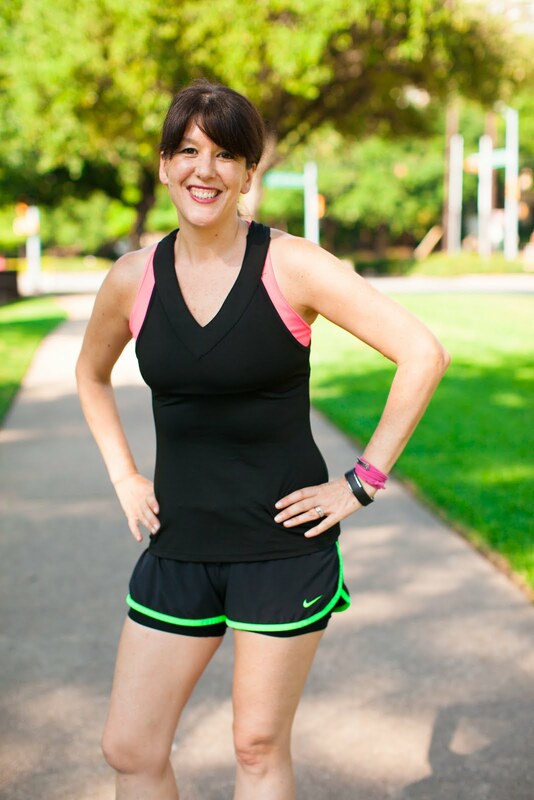 It seems so easy, eat healthful foods and exercise. It's the magic formula for successful weight loss, right? But what sounds easy isn't always simple. What exactly does "eat healthful foods" mean? 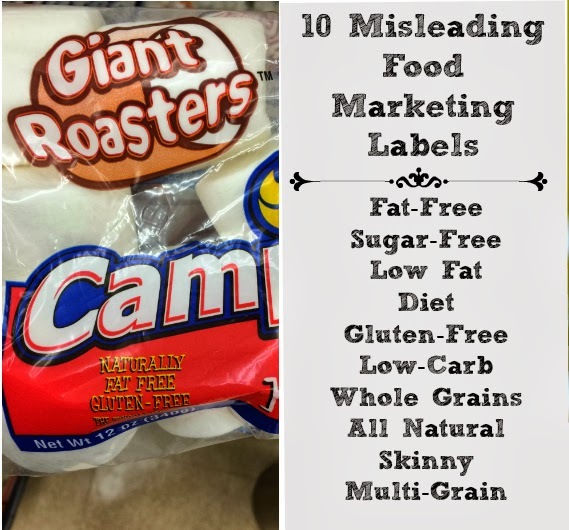 It can be so confusing with all the mixed messages and misleading food marketing labels. 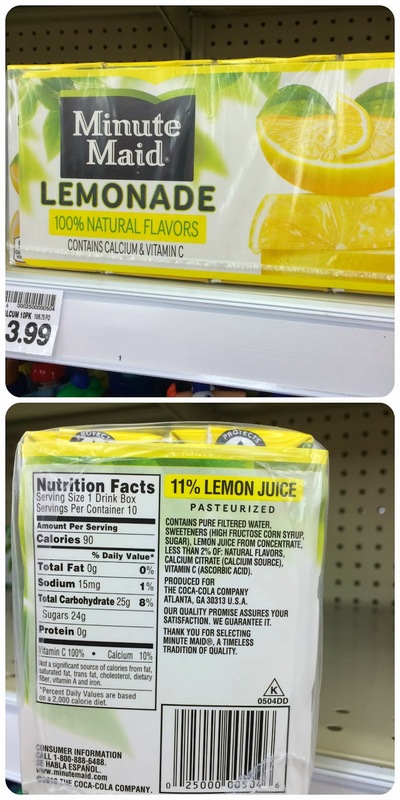 The thing that is most important to understand is that food marketing labels can be deceiving. Foods are being marketed as healthful choices, when in reality they are quite the opposite. This isn't intended to be a post about what you should or should not eat (as each person needs to make those choices for themselves under the direction of their doctor or nutritionist, and should not rely on blogs for that kind of advice). This is a post about being aware of what you are eating, so that you can make the best decisions for yourself, your health, and your family, based on reality, and not on misleading food packaging marketing. It is a problem because there are people who make buying decisions based on the deceptive food marketing tactics, who truly believe they are making the best healthful choice for themselves and their family. As a matter of fact, some of the so-called heathful call outs that you see on labels may just be the red flags you need to look for to alert you to possible processed foods disguised as health food. Packaging with claims of sugar-free, fat-free, low-fat, gluten free, all-natural, multi-grain, whole-grain, low-carb, low calorie, baked, and (especially) diet are likely to be the worst offenders. The claims themselves are probably true, but just because a package makes these claims does not mean it is a healthful food choice. 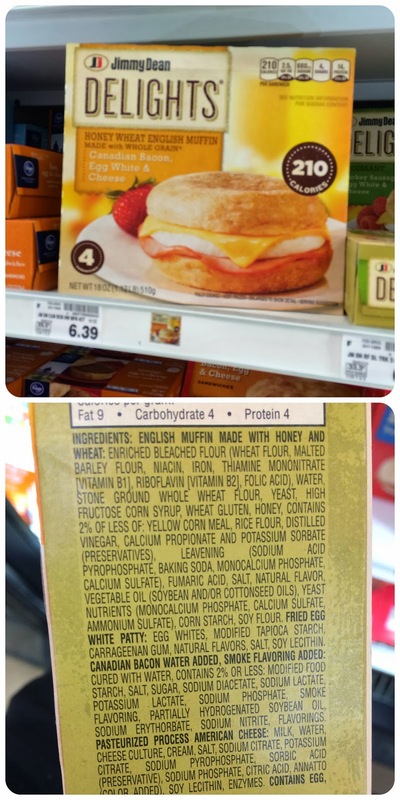 The good news is that there is an easy way to decipher if the food label is telling a misleading story, you simply can read the ingredients printed on the package. You should be able to pronounce and recognize every ingredient listed on the label. When trying to make a healthier choice, you should avoid foods with hydrogenated oils, high fructose corn syrup, and anything you can't pronounce or recognize as a real food. 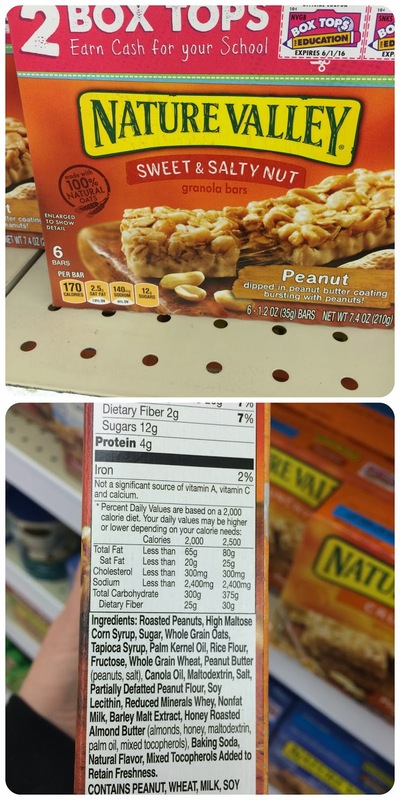 I usually read the ingredients list first, and if it passes the ingredients test (ingredients you can recognize and pronounce) then, and only then, do I start to read the nutrition label to see if the calories, fats, sodium, and sugars meet my nutritional needs. 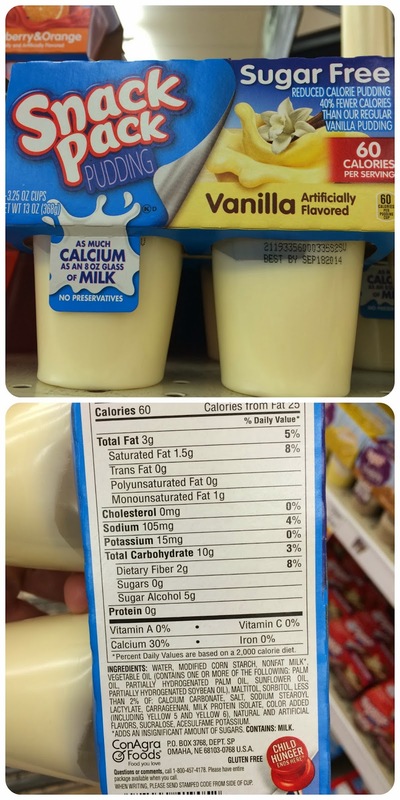 If you only read the nutrition label (and not the ingredients) you can be fooled into thinking something is healthy based on a low calorie or a low fat label. The ingredient list is the key to determining a truly healthful food. 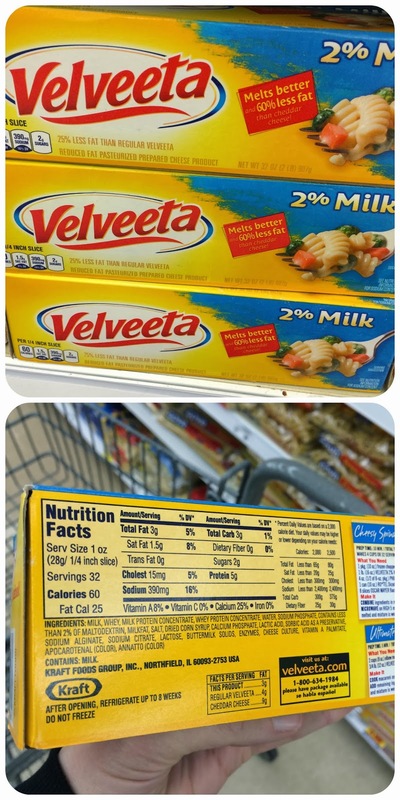 Does anyone really believe a big block of processed cheese is a healthful food choice? They try to tell you it is by the claims of "2% milk" and "60% less fat than cheddar cheese. "The ingredient list reveals the truth. The fact that is not refrigerated should be a major red flag. 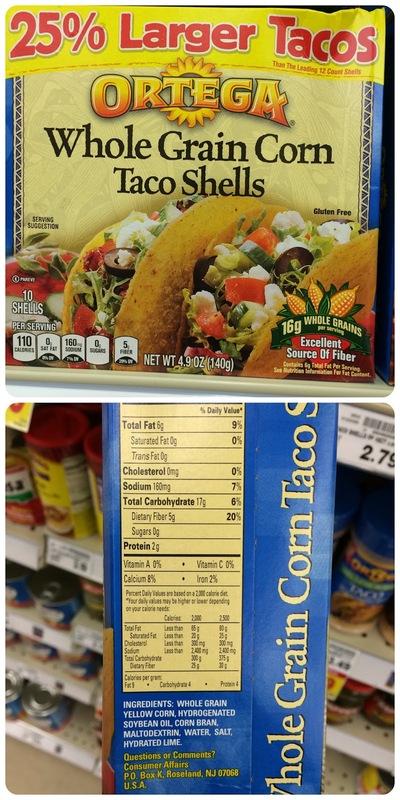 Whole grain taco shells seem like they would be a better choice than regular taco shells, but a a quick look at the ingredient list show hydrogenated oils. Just because something claims to have whole grains does not mean it is a healthful choice. All sounds good for you, right? The ingredient list shows a long list of processed ingredients. They hope to fool you with a few healthy sounding buzz words and a low calorie claim on the box. A better choice would be to build your own breakfast sandwich using 100% whole wheat English muffins and eggs you cook yourself. My blog friend Crystal at Simply Playful Fare wrote a blog post about how to make your own healthy frozen breakfast sandwiches. 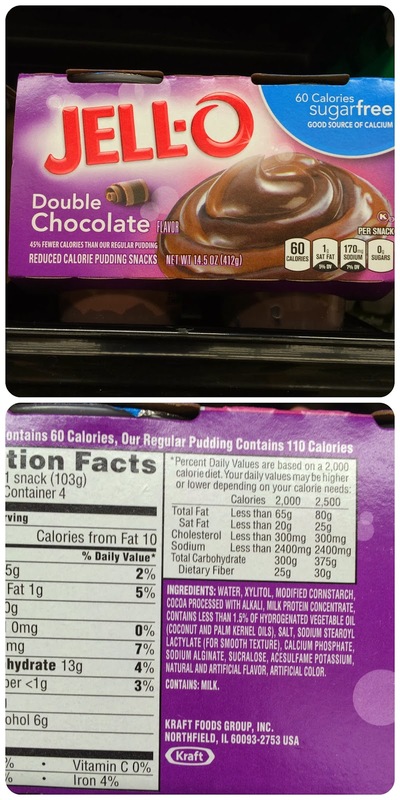 Pudding and Jello are both marketed as sugar free and only 60 calories, they sound like healthful snack choices, but a closer look at the ingredient list shows hydrogenated oils and other processed ingredients. Something from a company called Nature Valley with claims of 100% natural oats is healthful, right? It is a granola bar, after all. The word granola implies healthy in itself! A long list of processed ingredients tells another story. Love granola bars? How about trying these homemade oatmeal bars from the blog, The More I Run. Make your own bars from real ingredients. 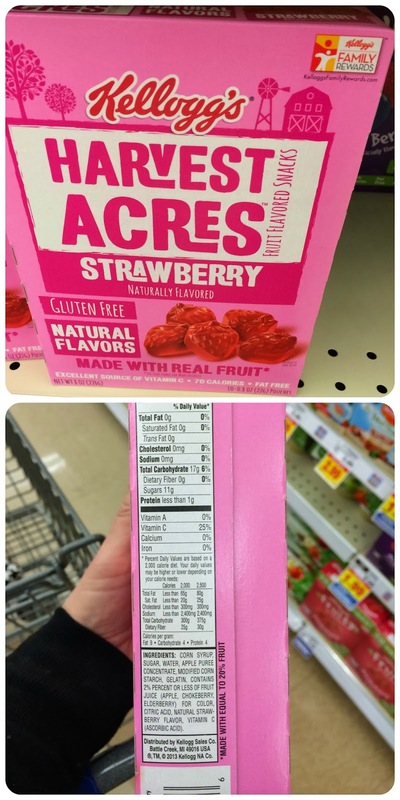 Maybe it does have the 100% natural flavors claimed on the front of the label, but a closer examination of the ingredient list and you will find it also has high fructose corn syrup. This cracker is called Baked Naturals and claims "always baked with no preservatives." It may seem like the healthiest option in the cracker isle, but the truth is crackers just aren't a health food, no matter what the marketing says. 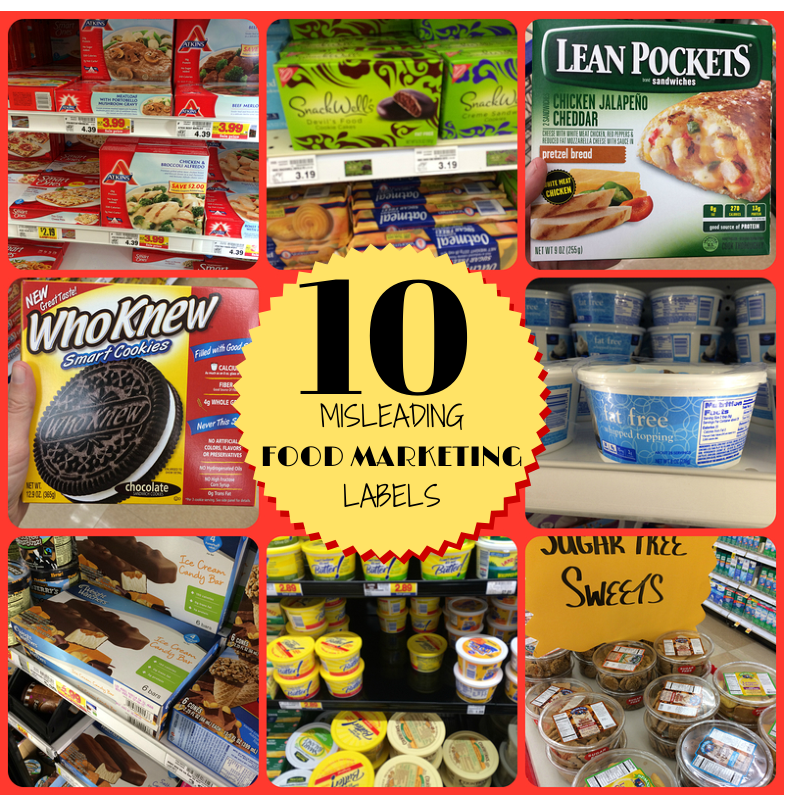 Brand name diet foods are some of the worst offenders. 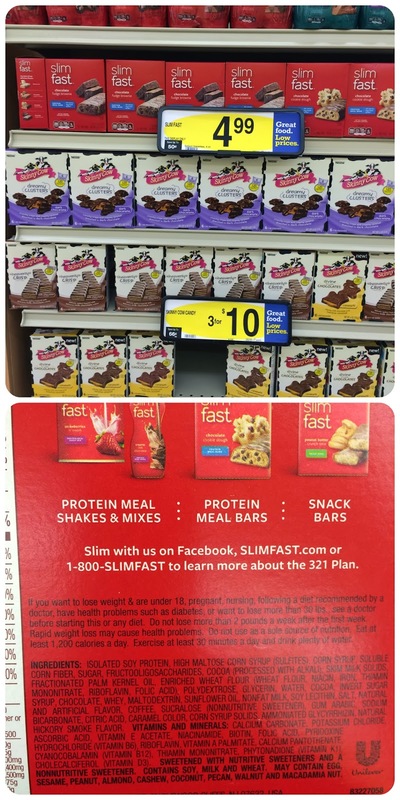 Brands that are marketed as weight loss products usually have the most inferior ingredients. 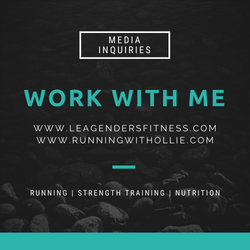 I've found the products with diet brand names, like Adkins, Weight Watchers, Slim Fast, and Healthy Choice are sometimes the most unfavorable choices. But don't take my word for it, you can verify for yourself by reading the ingredients list. 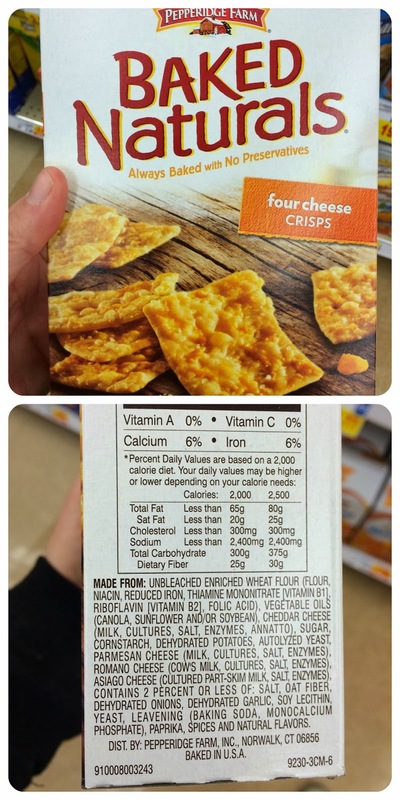 Everyone is jumping on the Gluten free bandwagon, including food manufacturers. You see, things like processed fruit roll ups (or marshmallows, or sugar) never had Gluten in the first place, so calling out Gluten free on the package is just misleading. Gluten free does not necessarily equal healthy. I could see how a well-meaning mom might read this package and think she was making a healthy choice for her child. With marketing claims like natural flavors, made with real fruit, Gluten free, and excellent source of vitamin C, it sounds like a healthful snack choice, but in reality, corn syrup and sugar are the first two ingredients, which indicates that this is not a healthful choice at all. How about some whole strawberries from the produce department? In my opinion, yogurt is one of the worst offenders of misleading marketing. 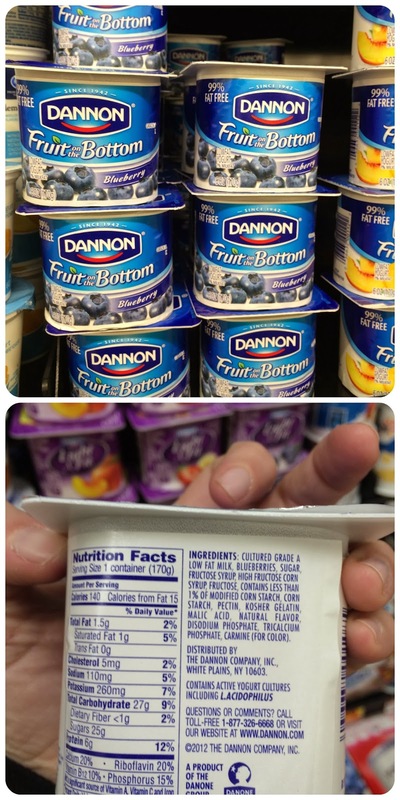 High sugar yogurts, often laced with high fructose corn syrup, are heavily marketed as health and weight loss foods. The fruit on the bottom yogurts are sometimes the worst! A healthier alternative is plain Greek yogurt with your own added fruit (that you purchased from the produce department). This is one of my personal pet peeves. I enjoy 100% whole wheat bread as part of a balanced healthy diet, but I have a problem with white bread that is colored brown and called wheat. 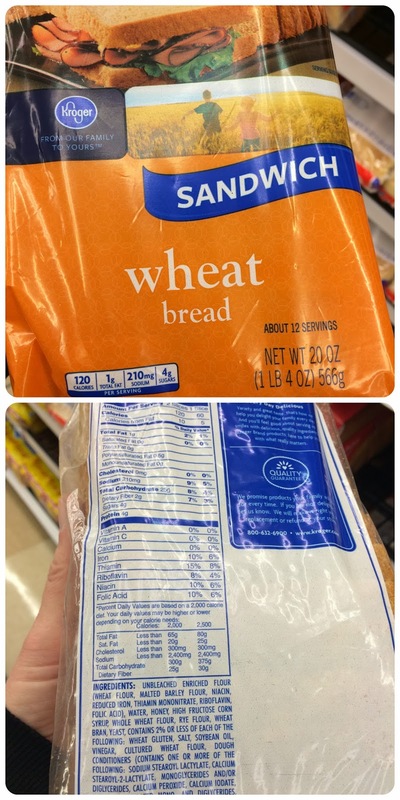 If it is truly wheat bread then the first ingredient of the label will be 100% whole wheat. If it says anything else, it is not really whole wheat bread. The purpose of this post is not to demonize foods, but to educate. If you want to eat a cookie, then eat the dang cookie. Enjoy the treats in moderation. Just be aware of what you are consuming so that you can make the most educated choices about what you put in your body. 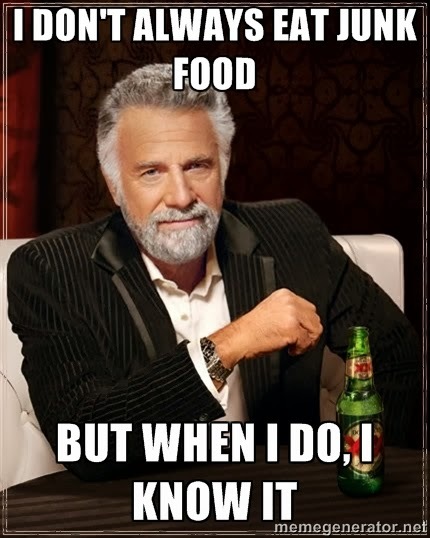 I don't always eat junk food, but when I do, I know it. Fat free is so bad for you! Your body needs healthy fats, and when you take the fat out of a product to make it "healthier", the manufacturers just replace it with sugar and sweeteners, which turn into the bad fat in your body. Think fat free peanut butter and fat free half and half. What IS fat free half and half by the way?? Hydrogenated oils are the WORST, which is why I only go to the movie theater sparingly, because you can't go and not have popcorn! And last, but not least, Yoplait yogurt is the worst. I find their commercials promoting their new "Greek Yogurt" line practically offensive. Oh, Yoplait won in a blind taste test compared to every brand of Greek Yogurt? That's because its loaded with sugars and sweeteners, and Greek Yogurt, especially Fage, is actually good for you. I, personally, like the tart flavor. Thanks Lea! 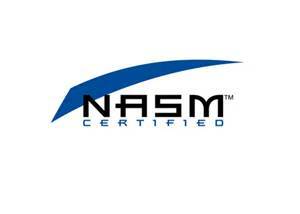 Very informative and educational!! couldn't agree with you more!! I hate the misleading marketing ploys that are so prevalent in our food industry. So many buy products just because they say sugar free, less sugar, blah blah blah. when shopping with my sister she commonly does this..."but it is says all natural flavors and no trans fat...." I try to explain it adds other unhealthy ingredients to make it taste just as good though..where it lacks one bad ingredient it makes up for it elswhere. If it has a label at all, maybe it's not that healthy. 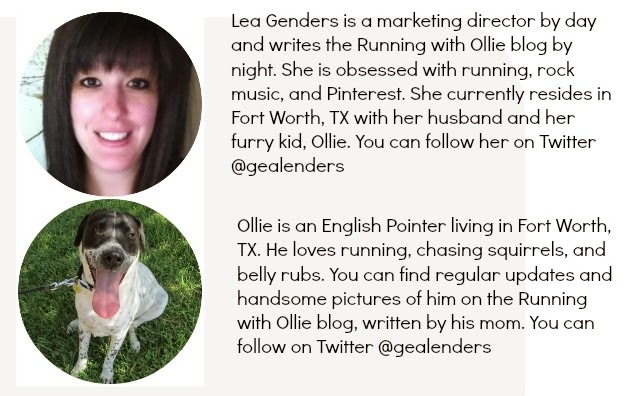 Really great info, as always, Lea. I'm terrible at reading labels, and I really need to get better. This is very helpful. I big fat puffy heart this post. People need to READ labels. I love love love this post!! Bookmarking it! Really great information!